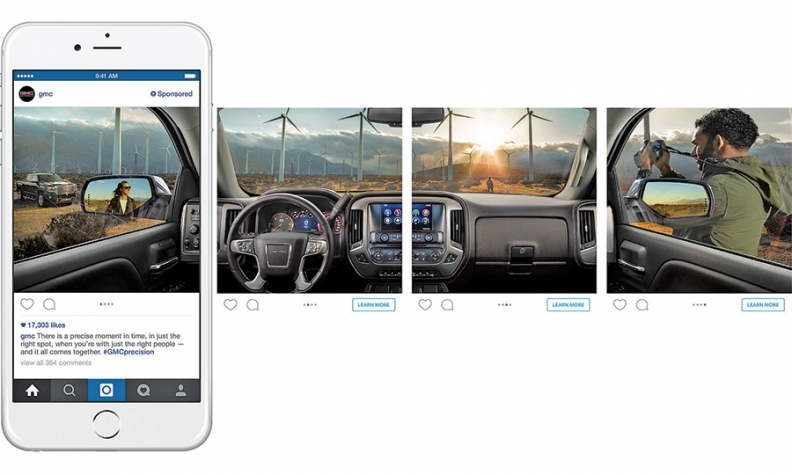 Using Instagram's Carousel format, GMC presented select users with snapshots of a California vista from the vantage point of a Sierra Denali's interior. The snapshots of a mountainous California vista that GMC presented to select Instagram users in a recent campaign would fit nicely in a high-brow magazine. The mountains are accented by thick clouds and massive wind turbines. The sun, peeking over the horizon, adds a glow to the scene. But underneath the luster lies a truck ad that captures the premium feel of the brand itself. Viewers take in the scenery from the vantage point of the Sierra Denali pickup's refined interior -- a perk that some may not expect from a rugged pickup. "We feel as brand marketers that Instagram is a fertile space, specifically in branding. It lends itself well to branded content," said Janet Keller, GMC's advertising, social media and digital manager. "It's a great learning opportunity for us. We're learning more about the audience, learning about engagement. We're testing different grounds." Instagram, the popular photo and video app that's a haven for creative imagery, was purchased by Facebook in 2012. It has 300 million active users. More than 30 billion photos have been posted on Instagram since its inception in 2010. The artistic quality of marketing content doesn't have to be watered down just because it's an auto advertisement, Keller said. Instagram's recently introduced Carousel format let GMC take viewers on a visual, gallery-style journey where people scrolled through a series of shots that showed only pieces of a scene. Only when users finished scrolling did they take in the entire image in what GMC calls "PanoGrams." In fact, tasteful photography is key for driving engagement on Instagram, where Keller says users tend to have a more discriminating eye for content than on other social platforms. This was GMC's first time using Instagram ads, which appear as sponsored posts on people's feeds. GMC deployed the platform's still-developing targeting capabilities to reach users between ages 25 and 54. Another PanoGram features a modern-looking California home with a Yukon SUV and Terrain crossover in the driveway. The two ads reached 7 million people and garnered 15 million impressions. An impression is the number of times an ad is seen. "You don't have to compensate for the beauty of photography because it's an ad or because now it's a car ad. It can work both ways," Keller said. "You can still have beautiful, worthy photography for Instagram and also weave the vehicle in there." GMC's Instagram effort, which took place from May 22 to the end of June, is the latest offshoot of its larger "Precision" campaign that was launched with TV commercials in March. One of the goals of the campaign was to cast a wider net for GMC by letting consumers know it sells more than pickups. To tell the brand story in a way that would sing on Instagram, GMC worked closely with Instagram staffers to ensure the content was tailored to the target audience. Keller said GMC briefed Instagram about its brand mission and strategy, then Instagram went out and created the content. The Instagram team was there from the beginning of the creative process, she said. "We were able to leverage their creative minds as well as their expertise," Keller said. "What better opportunity to work with Instagram than to work with the people who manage Instagram and have them give us their perspective on what makes good Instagram content?" 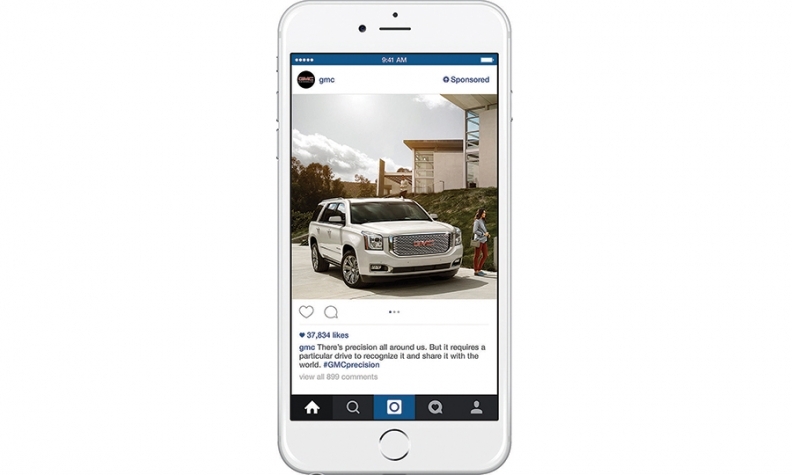 Now that the PanoGram promotion has run its course, GMC is retargeting the same Instagram users on Facebook. Keller said the Facebook content is an "evolution" of the visual storytelling that took place on Instagram. GMC is looking to bring attention to its entire lineup. "A lot of people associate our brand with pickup trucks, [but] we make more than pickup trucks. We make beautiful, well-designed premium crossovers and SUVs as well," Keller said. "For people who actually drive our SUVs and crossovers, we have very positive opinions of our vehicles. How do we basically convey that, and get that message to a wider audience?"